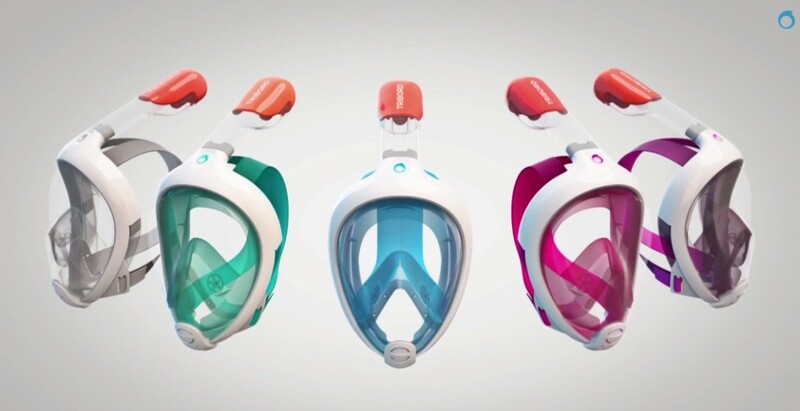 Last week, we got our hands on the Tribord Easybreath snorkeling mask and put it to the test. Released in Europe last year, this French-designed breathing mask was recently made its debut in the US market. The mask encompasses the wearers entire face, from forehead to chin, and allows for natural breathing to take place. The sturdy propylene shell supports the 100% shatterproof polycarbonate lens, and is wrapped with hypoallergenic soft silicone on the inside, which is divided into two sections – the viewing chamber and the breathing chamber. When the wearer inhales with the one-way snorkel above water, air is drawn in across the viewing chamber, and into the breathing chamber via pair of one-way valves. The introduction of fresh air, and separate chambers prevent the viewing chamber from fogging up. The wearer is able to breath through their nose or mouth as they see fit, and remarkably well at that. Exhaling can be performed at any time, and CO2 will escape the mask via single one-way valve located at the base of the breathing chamber, around the outside of the viewing chamber, and out the top of the snorkel. 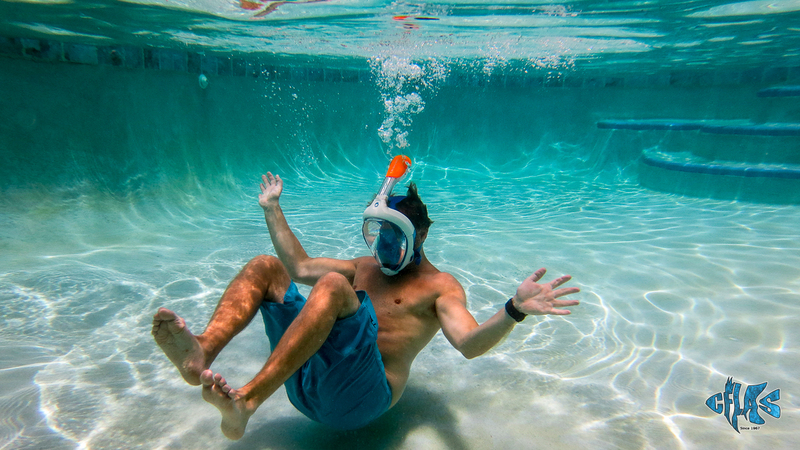 Similar to other self-sealing snorkels, the moment the wearer goes underwater, the snorkel inlet is automatically shut, preventing water from entering the mask. The mask comes in a mesh carrying bag, and the snorkel attachment can be removed to easily pack and transport it. Because there is a removable part involved, the tab that locks the snorkel onto the mask can become loose over time, but the connection is tight enough that that this should not be an issue. We had three product testers reviewing this product, each with a varying level of proficiency when it comes to snorkeling and diving – from novice to expert. It really says something positive about a product when multiple product testers from various backgrounds and skillsets all arrive at a similar conclusion – two thumbs up all around. Unlike traditional snorkeling or diving, there is no extensive learning curve. That is unless you are an avid diver, in which case you will have to keep in mind that you simply breath in normally once you hit the surface – there is no mustering up your last bit of breath to clear the snorkel. There is certainly a much higher level of tranquility when using this device. It allows you to relax and just enjoy your underwater surroundings. One of our testers stayed sat in the shallow end with the snorkel just above the surface of the water for several minutes, and said had it not been for the mask being a bit too large for his face, he would have easily been able to take a nap. It is important to select the correct sized mask, as it must fit snugly under your chin, and on your forehead. 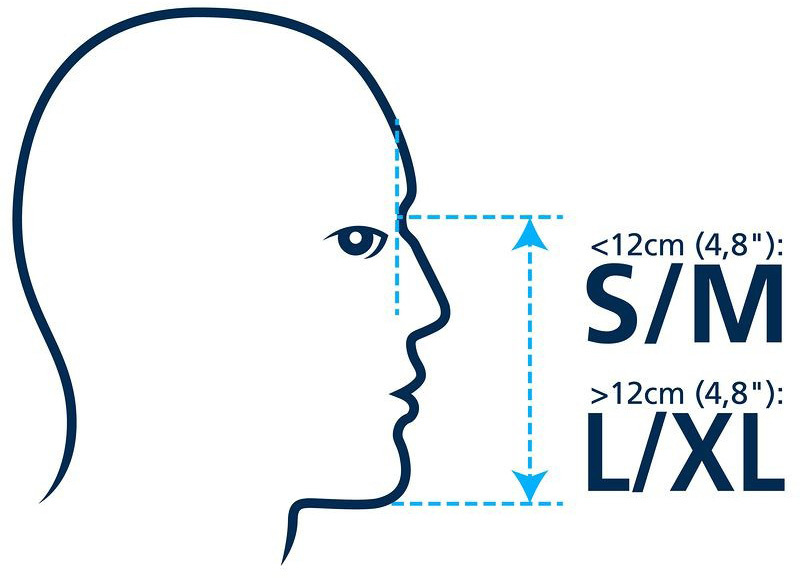 Tribord recommends measuring from the bridge of your nose to your chin. If your measurement is less than 4.8-inches, you will want the small to medium size (S/M), and a large to extra-large (L/XL) if your measurement is greater than this. Tribord also offers a child-sized mask. If improperly sized, water will gradually seep into the breathing chamber of the mask. Amazingly, having a light beard did not seem to hinder the performance of the mask and its water-tight seal. If there is any reason not to add this wonderful and innovative device to your dive pack or summer time vacation kit, it would be the sticker price – you can pick up a Tribord Easybreath snorkeling mask from Amazon for around $149 $129 USD. While this seems a bit steep, all of our product testers concur that the mask is definitely a top-quality investment, and should provide years of solid use. 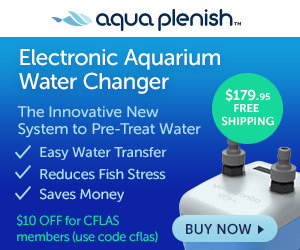 The Central Florida Aquarium Society gives the Tribord Easybreath two thumbs up!